Last week, myself, staff members from Alaska Wilderness League, a few mascots and some inflatable kayaks made our way to Lafayette Park just outside the president's house -- joining in the "kayaktivist" movement to protect the Arctic from Shell. The Save the Arctic movement has grown to a fever pitch this year -- what ignited in Seattle with kayaktivists has caught like wildfire throughout the nation. 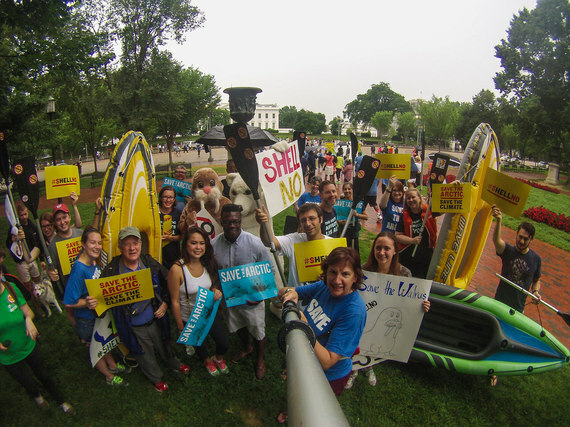 Hundreds of activists have paddled in kayaks, floated on boats and paddle boards, and joined in rallies to say "ShellNo!" And, just recently former Vice President Al Gore called drilling in the Arctic "insane." He reminded us of the BP oil disaster five years ago as well as the risks of offshore oil drilling. Gore said, "I think the Deepwater Horizon spill was warning enough. The conditions are so hostile for human activity there. I think it's a mistake to drill for oil in the Arctic. I think that ought to be banned," Gore said. Despite all of this, President Obama and his administration paved the way last week by issuing Shell's final permits to drill. Putting our climate and the Arctic's future in Shell's hands is the wrong move. Shell has proven time and time again that it is incompetent and careless in pursuing drilling in America's Arctic Ocean. In fact, Shell is heading to the Arctic without one of its primary ice breakers and its capping stack--which means it is leaving behind key equipment from its approved safety plans, all due to damage caused after poor management on Shell's watch. As we all remember, Shell's mishaps in 2012 culminated with the Kulluk, its drilling rig, running aground near Sitkalidak Island, Alaska, and ending its season in China as scrap metal. Whatever happens this summer we will be watching -- this fight is just beginning. Shell wants to build on this drilling season for next year. So we will continue the pressure until Shell is kicked out of the Arctic Ocean once and for all -- however long it takes. Speaking of fighting, Arctic champion Senator Jeff Merkley (D-OR) has stepped up to proactively protect America's Arctic Ocean. Sen. Jeff Merkley (D-OR) joined five other senators in introducing a bill called the Stop Arctic Ocean Drilling Act of 2015, to put an end to this risky and reckless proposition. "A spill in the Arctic would be an environmental catastrophe of extraordinary proportions -- and such a spill is inevitable if drilling proceeds," Merkley said in a statement. "Drilling in the Arctic Ocean is the height of irresponsibility. We need to put it off limits, permanently." Well said, senator. Shell drilling in the Arctic is not only an environmental catastrophe, but also a real threat to our continuing climate crisis. Our thirst for oil and other dirty sources of energy is killing our planet, melting the Arctic and destroying our climate. We must look to new cleaner sources of energy and break our addiction to dirty fuels. There is so much at stake -- our beautiful and iconic animals, like the walrus and polar bears and the people of the Arctic who call this place home. Shell's presence will wreak havoc on the animals and people of the Arctic, potentially harming and injuring our animals and severely impacting the health of the people of the Arctic. Shell has not heard that last from us. The millions of Americans that have come forward to Save the Arctic will not be silenced and will not give up. ShellNo!